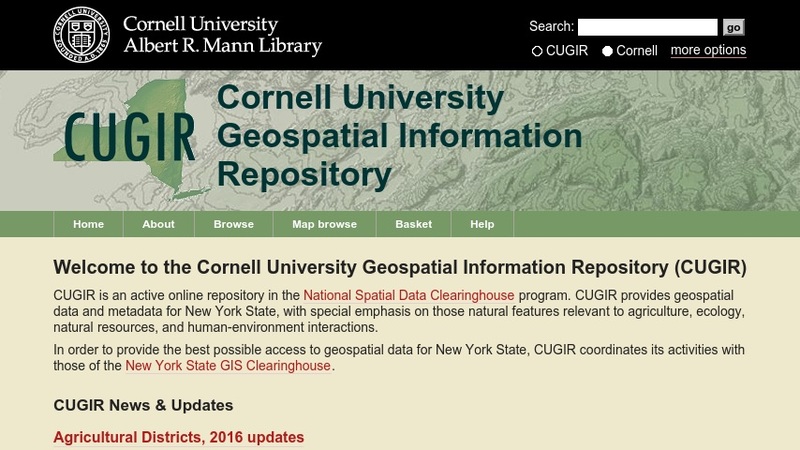 The Cornell University Geospatial Information Repository (CUGIR) is an online repository providing geospatial data and metadata for New York State, with special emphasis on natural features relevant to agriculture, ecology, natural resources, and human-environment interactions. The site offers downloadable datasets on landforms and topography, soils, hydrology, environmental hazards, agricultural activities, wildlife and natural resource management, and other topics. The user interface features image maps with zoom capability for graphically selecting a geographic area of interest. Datasets can be browsed by topic, data provider, spatial series (spatial units for which one or more data themes are available), or by an interactive map viewer. They are accompanied by extensive metadata, including title, theme, provider, coordinate system, data quality, spatial organization, entity and attribute information, and many other parameters.